Rumors cropped up last week that Apple had put down a big order for LED flashes, something useful for one thing, and one thing only: a digital camera. It doesn't take much to figure that the next iteration of the iPhone is likely to be packing one of these, since many of the latest cell phones--including HTC's recently released Nexus One, now have them included. 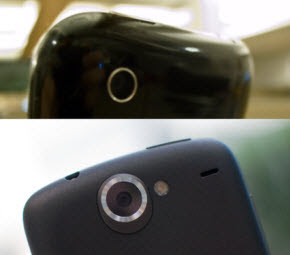 The Nexus One's 5-megapixel camera also has an LED-powered flash. That got me thinking: how does the Nexus One's 5-megapixel camera and its eye-searing flash stack up against the 3-megapixel, flashless camera module of the now-aging iPhone 3GS? Is the ability to take bigger, and better-lit photos worth touting as the end-all, be-all feature among smartphone cameras? The easiest way to figure that out is to run a few tests. Full disclosure here: I'm not a camera-testing expert. I am an avid photographer with a handful of pro gear, as well as a few high school and college photography courses under my belt. I'm not even going to try to get into things like testing dynamic range, color sensitivity, signal-to-noise ratio, etc. So instead, I've set up the two cameras to take essentially the same photo in various situations, to see how the two stack up. All photos in this comparison were taken within the same minute of each other, while balanced from a leveled tripod to maintain the same height and distance. Images were then transferred directly from the devices for analysis. All comparison shots are presented side by size, at full quality, without any recompression or conversion. Any timings were done with a stopwatch. It's worth noting that Apple is a little more liberal with the camera metadata, something the Nexus One could gain in a future software update. Right now, any photos snapped on it come without things like ISO, exposure time, aperture, and the lens' fixed focal length. However, both come with embedded GPS metadata, which makes for easy geotagging. It's just surprising that Google would have location, but not some of the more rudimentary camera info, within its metadata. Macro photo testing was done with a tape measure and a shipping box. A camera's macro-focusing capabilities are no minor benchmark. This is how good your camera is at focusing as close to a subject as possible. This is most useful for taking shots of business cards, bar codes, and QR codes. Between the two, the 3GS gives users a bit more control over what area they want to focus on, allowing users to simply touch the phone's screen to select the part of the photo they'd like in focus. The Nexus One, on the other hand, does the thinking for users, putting things into focus as it sees fit. In other words, users don't really know what the camera will focus on until after it takes the picture. 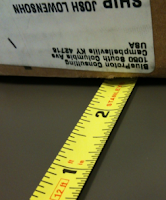 For our testing, we set a tape measure out across a table, and moved a labeled box closer and closer to the phone's camera, until it reached an optimal focus. For the iPhone, that length was 2.5 inches on the dot. A centimeter closer, and it lost a noticeable amount of sharpness. The Nexus One was able to pull in just a tad (and we do mean a tad) closer than the iPhone, coming in at 2.4 inches. To take it a step further, you can pull in both phones to about an inch of a subject and still have details such as text be legible. It's just not anywhere near as sharp as it is from 2.5 inches and beyond. Both cameras' close-focusing capabilities are to be commended, but between the two, we'd happily put the 3GS out as the victor. Despite it's 0.1-inch disability, it lets you see what will be in focus before you take the shot. It also refocuses as you get closer or farther away from your subject, which the Nexus One does not. Low-light performance is one of the big differentiators between these two cameras. Any camera nerd will likely scoff at the low-light capabilities of a camera phone and its tiny sensor, but in real-world use, this ends up being important. Having a camera you can use with less-than-ideal lighting can be incredibly valuable. The first part of the low-light test has both cameras taking photos in a darkened room, with very little available lighting. And the second test compares the iPhone to the Nexus One in an even darker room, with the Nexus One's flash on. The iPhone 3GS versus the Nexus One, from the same height and distance (in low light). Click to enlarge. 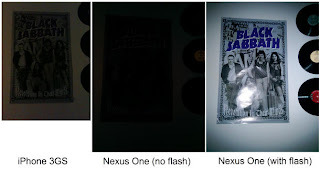 The iPhone versus the Nexus One in a very dark room. The third shot makes use of the Nexus One's flash. Click to enlarge. Pixel noise from the same shot, seen in its native resolution. 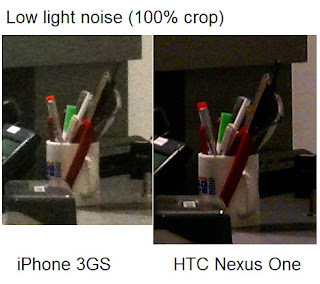 Worth noting is that the Nexus One had considerably less noisy phones than the iPhone in identical situations. Even with plenty of available light, the iPhone's photos still had a noticeable amount of grain, when viewed at 100 percent. That said, the noise on the iPhone can be more pleasing. Take a look at the shot from the darkened room: there were fewer blue color aberrations within the grain, the kind you can really see when viewed on a large monitor or photo print. Such things can be removed in post-processing, but it's nice to start out with fewer. Both cameras exhibited very little distortion--at least not enough to ruin your photos, if you're taking shots of things like buildings. Straight lines stay straight, and subjects that appear in the corners of the frame do not look bent or stretched. This isn't very surprising, given that both lenses have fixed focal lengths and aren't very wide. The iPhone's focal length is 3.85mm, but because of the tiny sensor's crop factor, this ends up being equivalent to a 37mm lens. The Nexus One is noticeably wider. Shots taken with it, from the same place as with an iPhone, show much more of the scene within the frame. Using the Nexus One is basically like taking a big step back, if you were to be using the iPhone. This can come in handy, if you're snapping pictures in a small room, or trying to get a tall building into your shot without having to change positions. • Both cameras make it easy to see what's in the frame with a large preview display. Between the two, the Nexus One's higher-resolution OLED screen presents a more vibrant image with noticeably deeper blacks. It also has a faster frame rate, leaving less on-screen blurring when you're framing your subject. Android's camera app has a number of advanced settings the iPhone's stock camera does not offer. • The Nexus One's camera app comes with a number of advanced settings the iPhone's stock camera app does not. 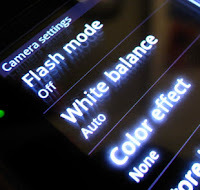 This includes the options to turn the flash on and off, to tweak the white balance, to apply a digital color filter, to pick the quality and size of the shot, to change the focus mode to infinity, and to turn geotagging on or off. 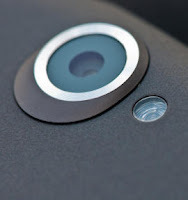 • The Nexus One's camera lens is protected by the back of the phone's case, which can be removed to access the battery, SIM card, and MicroSD slot. This could lead to a wealth of aftermarket camera add-ons, which, for the iPhone, have come in the form of cases. • Photos taken on the Nexus One are automatically stored to the microSD memory card, meaning that you can retrieve your photos, even if the rest of the phone goes kaput. Unfair comparisons aside (we are, after all, comparing newer technology to older), it's pretty clear that the Nexus One's camera is more capable than what's found in Apple's 3GS. Was this a surprise? No. But it is great to see how big of a gap there is between the hardware packed into a device unveiled in June of last year and the hardware we're getting in January of this year. Even better, both of these cameras can be augmented with extra hardware goodies that can make photo taking in new directions (the Nexus One especially, as noted above). Software can help a phone's camera go far beyond its stock capabilities. This has already been proven true on both platforms, which have a myriad of camera apps, though Android developers continue to have the problem of an increasingly wider range of hardware they need to support. The most surprising difference in the two cameras is the difference in the low-light performance. When you're shooting in a dark or darkened room, you're going to want a camera with a flash. Otherwise, you end up with a grainy, almost-unviewable shot. This was most apparent in our poster picture from the darker-room test above. Whereas the iPhone came out on top in picking up the poster with no flash (likely due to a higher baseline ISO), it got blown away, in terms of colors, sharpness, and noise, when the Nexus One got to break out its flash. Of course, neither of these phone cameras is as desirable as a point-and-shoot or, even better, a real SLR with a big, light-sucking sensor in it. But in a pinch, I'd take the camera on the Nexus One over the iPhone's any day. Even without the flash.